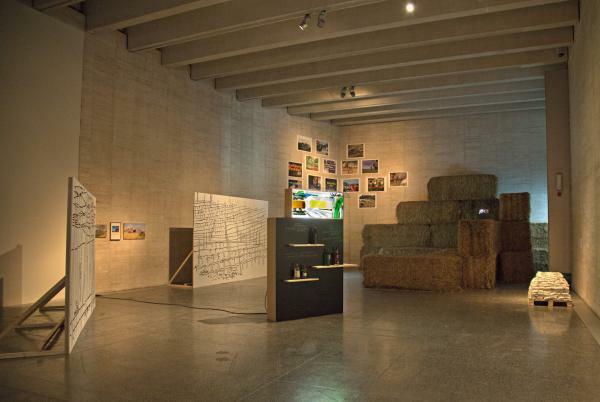 Manuel Olveira, director of the Museo de Arte Contemporáneo de Castilla y León, invited Antje to develop a contribution to the exhibition Sector Primario, focusing on land use, mining and agriculture. Part of this contribution was a new film and painting for the archive of I like being a farmer and I would like to stay one in cooperation with Rodrigo and Toño Blanco Gutiérrez. For the exhibition, an auditorium was built from straw, which was used for gatherings throughout the exhibition time, apart from serving as cinema. Antje used the space for a stage-like installation with scenes and Schnapsbar. The scenes were inspired by local production landscapes. León is known for it´s gothic cathedral, and the cathedral is known for it´s medieval glass windows. Because of these windows, there is a local tradition of artistic glassmaking. With the support of the art academy of León, a glass panel was produced for an exclusive light box for the Myvillages Schnapsbar. The curator contributed orujo, destilled and bottled by his father in the 70ies, the oldest illegal Schnaps so far in our collection.